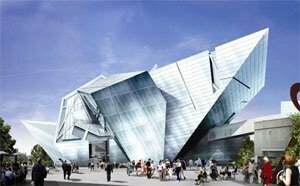 “It’s hard to believe that the majestic new addition to the Denver Art Museum is Daniel Libeskind’s first completed building in the U.S. In 2003 Libeskind won the competition to design the master plan for the World Trade Center site. For the next year or two, he was so pervasive a media presence–the black glasses, the Polish accent, the inexhaustible cheer–that you half expected a spiky Libeskind tower to erupt soon on every street corner. Then the Trade Center project got away from him. The New York City developer who held the lease on the Twin Towers brought in his own architect to “collaborate” on the centerpiece Freedom Tower. Libeskind, who was a canny enough player to have ushered a Jewish Museum into the heart of Berlin, was gradually marginalized. By the time construction began in April, the much revised skyscraper bore so little resemblance to his original idea, he had taken his name off it. This article was originally published Sunday, September 3, 2006.